Since 1881, the University of Nebraska Medical Center (UNMC) has been providing Nebraskans with excellent and advanced healthcare, and our department has been an integral part of it year by year. Herein, we give a summarized version of the department; however, for a more detailed history of pathology and microbiology at UNMC and the formation of the department, please see a wonderfully written account by Dr. James Newland, emeritus professor for the department, and Brian Lenz, entitled, "Pathology and Microbiology at UNMC: A historical view of the department from 1882-2001." In 1902, the Omaha Medical College was merged into the University of Nebraska and renamed the University of Nebraska College of Medicine (UNCM). 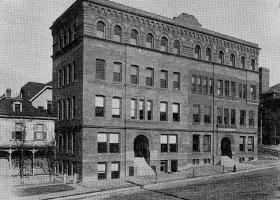 After the construction of a new building in Omaha to house all medical instruction in 1912, the second year pathology course was significantly expanded to 306 hours and clinical pathology was added as a third year course. This expansion led to new pathology faculty members joining UNCM, including Oscar T. Schulz, M.D., and A. A. Johnson, M.D. In 1917, the department had been renamed the department of pathology and bacteriology. Bridging the World War I and II years, Harold Eggers, M.D. was designated as professor of pathology in 1917 and remained as chairman for 31 years until his retirement in 1948. Joining the department in 1923, Miss Helen Wyant was the first trained medical technologist on the faculty and in the state of Nebraska. James Perry Tollman, M.D., joined the department in the academic year 1931-32 and later became its chairman in 1948 and subsequently Dean of the College of Medicine. ﻿﻿In 1954, John Rudolf Schenken, M.D., head of pathology at Nebraska Methodist Hospital was named chairman of the department of pathology at UNMC. Dr. Harry W. McFadden, a product of the UNCM College of Medicine and trained in the department of pathology and bacteriology, was named chairman of the new department of microbiology in 1955. Francis Smith, M.D., a superb clinical pathologist, was brought into the department in 1956. The department purchased the first transmission electron microscope on the campus in 1957 and was expertly utilized by Richard B. Wilson, M.D., another College of Medicine graduate and pathologist trained by the department. In 1965, C. A. McWhorter, M.D., became chairman of the department. At this time, there were approximately 335 hours of instruction in general and clinical pathology. In 1968, the medical technology teaching program took part in a successful consortium of three hospitals. The department continued to expand in faculty through these years. In the 1968, the clinical pathology course was changed to one of significant amount so small group, case-based teaching. Over the 1970s, pathology instruction hours were decreased. The clinical laboratories continued to expand. In 1981, David Theodore Purtilo, M.D., became the chair very quickly expanded the research capabilities of the department, bringing to it world-wide recognition. Research and clinical faculty were added in greater numbers than previously. In 1984 the department of microbiology joined with the department of pathology, being renamed Pathology and Microbiology. With this, the department's graduate program expanded. Upon his arrival in 1983, Dennis Weisenburger, M.D. took directorship of the highly successful Lymphoma Study Group and was instrumental in the later stem cell transplant program. Talented hematopathologists were attracted to the department. Through Dr. Rodney Markin, the department skillfully supported the role of UNMC's liver transplant program. In 1992 on Dr. Purtilo's untimely death, Dr. Samuel Monroe Cohen, M.D., Ph.D., who was recruited as vice chairperson for research and education by Dr. Purtilo, became department chair. Research efforts continued to expand with significant amounts of NIH-supported activities. In 1997, University Hospital merged with Clarkson Hospital and eventually did the service pathology for the latter hospital. Steven Hinrichs, M.D., became Chair of the department in 2008. Earlier, in 1997, he had been named the director of the Nebraska Public Health Laboratories, and the laboratories moved to the Omaha campus. Dr. Hinrichs had continued the excellence in leadership of the Department of Pathology and Microbiology. Now, over 100 years since the inception of the Omaha Medical College in 1882, the changes to the university and the department are profound and delightful. Harry W. McFadden, Jr., M.D. 1992-2007 Steven H. Hinrichs, M.D.